From his first visit on a geology field trip from East High School, young George Cranmer became fascinated with the natural acoustics of Red Rocks. This fascination became a dream that would not leave him. Years later, when Denver Mayor Benjamin Stapleton appointed him Manager of Parks & Improvements, Cranmer’s planning began in earnest. But how would he fund it? Simultaneously President Franklin D. Roosevelt was creating the Civilian Conservation Corps as part of his solution to the rampant unemployment and economic chaos that gripped the country. With this action, the President brought together two wasted resources: the young men and the land, in an effort to save both. Using designs by Denver architect Burnham Hoyt, Cranmer presented his plan to the National Park Service. 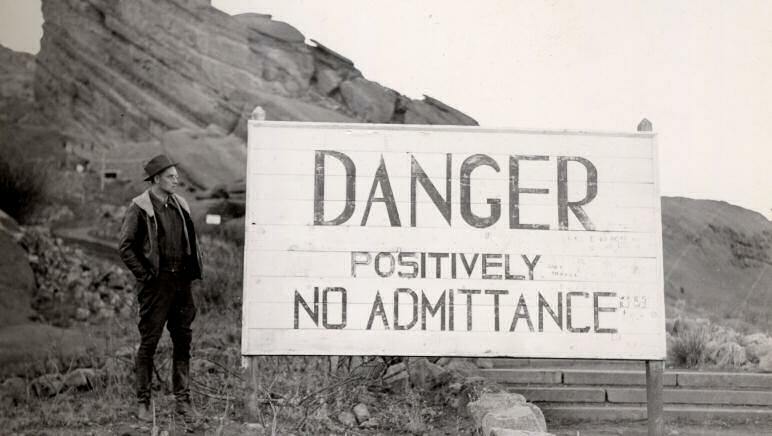 On May 17, 1936 came the exciting news of the approval of the development of the Red Rocks Theater by the CCC – and work was to start at once! Now Mayor Stapleton was not a big fan of the theater. In fact, the Mayor believed theater was evil and that actors and actresses were generally evil as well. Mayor Stapleton really envisioned this site as a large rock garden, and in fact the area where the seating is now was filled with huge red boulders. So, over a period of time the workers drilled holes in the bases of all the boulders and inserted dynamite in order to blow them all within a few minutes. The foreman called Cranmer late one night and told him, “Tomorrow is the day we do the big job.” Cranmer promptly went on an inspection trip the next morning to Daniels Park – which conveniently had no phones! Returning to his office late in the day, his secretary informed him that the Mayor had been looking for him all day – “the entire Red Rocks Park has been blown up!” Fortunately the Mayor was a good sport and was a proud as anyone when the theater came into use. And the rocks? Well, they became a part of the necessary landfill in the south side of the seating area. * Edward Teyssier was actually Superintendent of Construction on this project. He worked for the National Park Service, which was the oversight agency for all park-oriented CCC projects in Jefferson County.